Following the release of he's brand new LP: 'ABCD', UrbanJazz Review's Paul Richards, caught up with UK Afrobeat & Hip Hop artist to ask him a few questions about Life, Career and the Future. Q.1 Hi Afrikan Boy, how are you doing? Q.2 - First of all, what made you choose the name 'African Boy' as a stage name? Originally I used to go by the name 'Lynxman' lol when I was 15 then it changed to 'African boy' shortly after I began using my Nigerian Heritage and upbringing to influence my music. The final change was when I learnt to #SpellItWithAK "AFRIKAN BOY". I chose this name because it represents my continent. 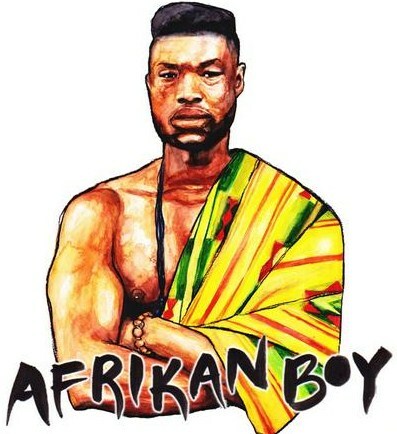 AFRIKAN BOY is a vehicle that carries the infinite stories and experiences of all AFRIKAN BOYS world wide. The name could belong to anyone! and it carries mystery and humour. Q.3 - What in your opinion is the current state of African Culture particularly that of Nigeria in the eyes of young people of Nigerian descent? Many young British Nigerians like myself still have the culture dictated to us by the elder generation for example attending weddings and birthday parties we're a big part of my childhood when it came to understanding the culture. However there has been a change in perspective aided by the strong influence of West African pop culture. Many young British Nigerians now have the music to relate to especially as the music is a blend of US+UK and West African flavours. Q.4 - When you were growing up as a youngster what most inspired you about being Nigerian? The thing that inspired me the most about being Nigerian was the food! lol My favourite dish is Pounded yam (Iyan) and Spinach stew (Efo riro). The food cooked by mum always reminds me of my roots. No knife and fork is needed to chow down the meal! Another thing that also inspired me as a youngster was the Nigerian mentality that i learnt from my parents and relatives. Q.5 - What is your opinion of African ancient History and do you think it is taught and appreciated enough by Nigerian parents? African History for me IS the most important history to learn about and to teach. I personally feel my parents did not expose me at all to our true history and I was left to discover it on my own. This could have been due to them not being taught or simply not placing priority on it. My parents didn't really teach me about slavery either, my Caribbean friends all said they we're forced to watch 'Roots' in their childhood but I never had that experience. I thought maybe Nigerians don't like to associate themselves with slavery? I would like to teach my kids the vast history of the Africa allowing them to have an Afrikan centred view of the world and remain proud! Q.6 - Should more African ancient Culture be taught in schools? Absolutely YES! It disgusts me the level of disregard the current curriculum has for African History. You can't truly educate the kids by teaching them one sided lies. To be honest its world history but we can't rely on european schools to educate our kids fully. Q.7 - What aspect or area of Nigerian history most interests you? The lineage of the people and the genes from which various tribes we're created from. Q.8 - Do you think the new burgeoning Afrobeat scene is a good conduit or vehicle to promote African culture to the rest of the World? Not really, because some of the music as I stated earlier is a fusion of popular culture and west african music. The afro beat scene has been good for levelling the musical barriers between dancehall/reggae and afrobeats. All the young afrikan boys and girls now feel represented in the music scene so it is good look. However my only caveat on the topic would be that not enough artists sing meaningful songs. majority of it is simply mirroring whats going on in other parts of the world. The music scene is at its strongest when the influence starts and ends on the continent! Q.9 - What influence do you think Fela Kuti has had on publicising not only Nigerian but also African culture as a whole? Fela is a GIANT! His music a great example of promoting african culture and messages. Artists like Fela are important because they make important messages and ideas accessible for the every day man to digest! His music will continue to be a compass pointing those looking for African consciousness in the right direction. Q.10 - What can be done to further educate people about the history of African cultures such as the Yoruba? I have seen a rise in Afrikan centred events aimed to inform, address and educate but I think we need more of these happening. We need more online content to reach out to the Diaspora's such as african cartoons for children to watch. We need to make reach the youth with the knowledge! They are the ones that need it the most. Q.11 - What aspects of Yoruba culture most interest you? The spiritual and religious aspects of Nigerian history interest me. I would like to do more research into the spiritual systems of my ancestors. Also the language the yoruba proverbs also interest me. Q.12 - What aspects of Yoruba culture most make you proud to be Yoruba? Q.13 - What lessons if any, can the Yoruba culture teach the rest of the World? I think we have a lot to offer in terms of rich heritage, impressive arts, and I feel if you search deep enough you can find the secret of the human race in yoruba culture. Q.14 - As a member of the Yoruba tribe, what inspirations to you draw from Culture to enrich your music? Q.15 - As a young person do you think more young people of Yoruba descent need to embrace the cultural & religious practices? YES I believe a lot of young men are looking for their own identities but if we don't claim our own then we end up being owned! Q.16 - Do you think the Culture and especially the religion is appreciated enough back home in Nigeria? To be honest I'm not entirely sure. My last visit to Nigeria didn't answer that question for me. At the moment I think we need to enbrace it more because it seems like all I see is the christians and muslims and everything else is just non existent; which i know is not true. Q.17 - As there are estimated to be over 42 million Yoruba speakers world-wide, do you think more should be done to promote the traditional religious & cultural practices like the Hindu religion, which is also an ethno/religious group? Q.18 - Do you think more should be taught about Traditional African cultures like the Yoruba should be taught as part of the national curriculum to children at school the same way the Indian culture & Jewish cultures are taught? I think AFRIKAN Culture as whole needs to be injected into the current school system but I also believe we can not wait for the white mans system to bring it in. We need to move on it ourselves! It all starts from Home! Q.20 - What message would you give to young African's living in the UK perusing a career in the music industry? Dont believe the hype! Stay Original! Dont lose your roots! Work HARD on your craft! Earn a living! Use the technology around you and utlise the organisations that offer help to young creatives under 25! Your only young once! Q.21 - Finally, what role do you think Nigerian history and culture or even religion can play in the lives of young Nigerians living in the Diaspora? It will help keep us to keep grounded with our eyes firmly set on improving and building our homeland! Viva Nigeria!